Well, this is my first post on my blog. Am I nervous about showing the results of my crafting exploits for all to see on the web? Well yeah – just a bit! My name is Karen and I have been crafting for nearly 6 years and now, would like to share some of my crafty projects through the power of the blog! I started with card-making which led to scrap-booking then sewing with a little bit of knitting thrown in for good measure! Although I’m far from being an expert in any of these fields – I enjoy them – alot, and that’s what crafting should be about. Of course we all want to do the best we can in whatever it is we are creating, but join me in my crafting journey (sorry for sounding ‘cheesy’) and I’m sure we’ll have fun on the way! So, for my first project – with Mother’s Day not far on the horizon, are 2 cards that I have made for my Sister to give to our Mum and her Mother-in-Law. 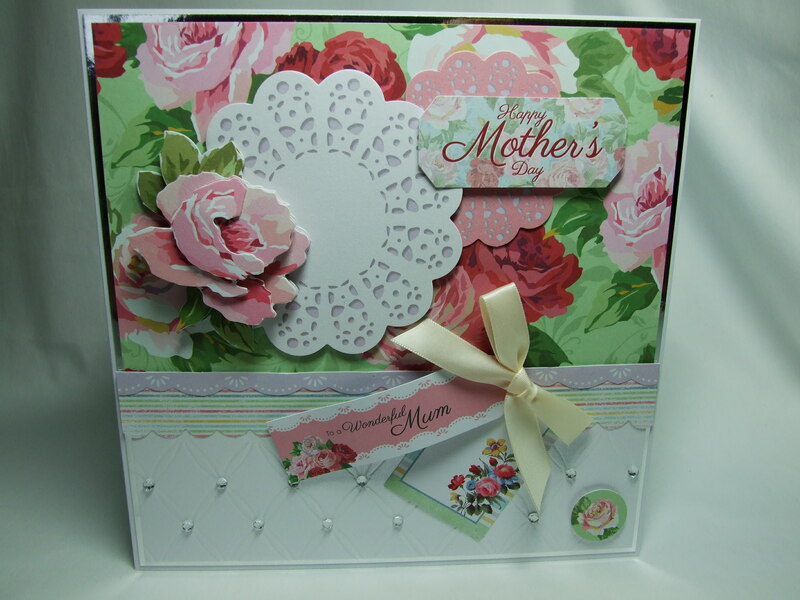 I have used the ‘Simply Floral’ Ultimate Die-cut and Paper Pack from Docrafts Papermania collection. These packs are packed with toppers, decoupage, mini envelopes, tags, borders and papers and at the end of the day who doesn’t like flowers?!! At the moment floral prints – especially the ditsy prints are really on trend and I think this kit follows that trend really well. The colours and prints in this set are so pretty and vibrant, suitable for any occasion that you are making for. I have used an 8×8 card blank for both cards. Apart from the Centura Pearl card which I embossed with a Tattered Lace embossing folder, the gemstones and ribbon, everything else was from the kit. Please note that I have not been given any product here, everything I make is from my own stash that I’ve had to buy (unfortunately!) myself and have not been paid to review it either – all views expressed are 100% mine and truthful. Well, that’s my first post done! I know I have a lot to learn about blogging – so bear with! Next time I will be looking at Easter – namely some cute packaging ideas for those yummy Easter treats which would make nice gifts. Hope you visit again soon – Karen.